My name is Donna M. Phelan. 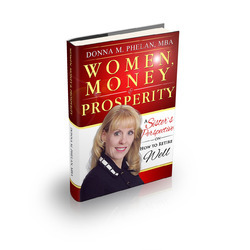 I am the author of "Women, Money & Prosperity: A Sister's Perspective on How to Retire Well." I am a keynote speaker and have been featured in CNBC.com, Yahoo! Finance.com, USA Today, Houston Chronicle, Chicago Tribune among others. I have an MBA in Finance from University of Connecticut. My passion is to start a national conversation about women and retirement. My website is donnamphelan.com.